This recording features thirteen of the 44 contemporary anthems in Choirbook for The Queen – published to celebrate Queen Elizabeth's Diamond Jubilee in 2012. All eleven of the anthems especially-commissioned for the book are included on the CD. Unto Us Is Born A Son (arr. David Willcocks)  Sir Christèmas (William Mathias)  Adam Lay Ybounden (Peter Warlock)  This Is The Truth Sent from Above (Trad. arr. Ralph Vaughan Williams)  People, look East (Words: Eleanor Farjeon; Music: Christopher Steel)  Of the Father's Heart Begotten (Words: Prudentius; Melody from Piae Cantiones; arr. D. Willcocks)  I Sing of a Maiden (Patrick Hadley)  Sweet was the Song (Grayston Ives)  O Little Town of Bethlehem (Words: Phillips Brooks; arr. Vaughan Williams & Thomas Armstrong)  Dormi Jesu (John Rutter)  Away In A Manger (Tune: W. J. Kirkpatrick, arr. George McPhee)  The Little Road to Bethlehem (Words: Margaret Rose; Music: Michael Head)  Bogoróditse Djévo (Arvo Pärt)  In the bleak mid-winter (Words: Christina Rossetti; Music: Harold Darke)  Carol of the Bells (Words: Peter J. Wilhousky; Music: M. Leontovich)  Mater Ora Filium (Music: Charles Wood; Arr. Harrison Oxley)  Sequence from Christus (Felix Mendelssohn)  The Three Kings (Words & music: Peter Cornelius, arr. Ivor Atkins)  O Come All Ye Faithful (Words & melody: J. F. Wade, arr. Willcocks)  Ding! Dong! Merrily on High (Arr. Mack Wilberg)  Hark! The Herald Angels Sing (Words: Charles Wesley; Music: Mendelssohn, arr. D. Willcocks)  Choir of the City of London School, directed by Paul Harrison with Stephen Disley (organ). 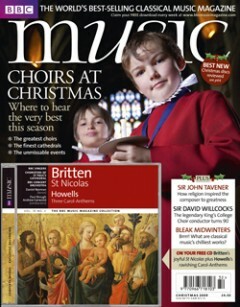 The Christmas 2009 edition included a CD of Benjamin Britten's cantata Saint Nicolas, performed at Lancing College Chapel by the BBC Concert Orchestra, the BBC Singers, the boy choristers of St Paul's Cathedral (conducted by Andrew Carwood), with Stephen Disley (organ), directed by Paul Brough. Starring multi-platinum artist Josh Groban, Tony-winning Idina Menzel, and Tony-nominated Adam Pascal, Chess In Concert features the music of ABBA's Björn Ulvaeus and Benny Andersson and the lyrics of Tim Rice. Recorded in May 2008, this live spectacular is introduced by Rice and includes the City of London Philharmonic Orchestra together with the 100-voice West End Chorus. Stephen Disley (organ). The Choir of Southwark Cathedral. Stephen Disley and David Pipe (organ), Peter Wright (conductor). Joy to the world  People, look East  A tender shoot  Go, tell it on the mountain  Once in Royal David's city  Ding-dong, ding  What child is this  God rest you merry, gentlemen  God is in Bethlehem  Love came down at Christmas  Come and sing  Bethlehem, we come to bring  Infant holy, infant lowly  Lift up your heart and raise your voice  Away in a manger  Ding-dong! Merrily on high  Child of Heaven born on Earth  I see your crib  Calypso Carol  Ring out the bells  Jesus Christ the Lord is born  Stranger in Bethlehem  O come, all you children  Silent night  Descend from heaven  O slumber, heaven-born treasure  It came upon the midnight clear  Bright mystical starlight  No small wonder  Hark! The herald angels sing  The Choirs of Southwark Cathedral, Stephen Disley and Martin Ford (organ), Peter Wright and Stephen Disley (conductors). John Mark Ainsley (tenor), Julie Kennard (soprano), Stephen Disley (organ), Royal Liverpool Philharmonic Orchestra and Choir, Vernon Handley (conductor). James Loughran, Vernon Handley, Michael Rippon, Michael George, Anthony Rolfe Johnson, Catherine Wyn-Rogers, Stephen Disley. Hymn: Creator of the stars of night (Plainsong)  Bidding prayer  This is the truth sent from above (Vaughan Williams)  Reading: Genesis 3 8-15  Remember O thou man (Ravenscroft)  Chorale Prelude: Wachet auf BWV645 (Bach)  Reading: Isaiah 45 2-8  O nata lux (Tallis)  I said to the man (Maxim)  Reading: Isaiah 9 2-7  People look East (French, arr. Bramma)  Hosanna to the Son of David (Weelkes)  Reading: Luke 1 26-34  Salutatio angelica (Moore)  Reading: Luke 1 39-47  Advent antiphon: O Emmanuel (Chant)  Magnificat in G (Stanford)  Advent Antiphon: O Emmanuel (Chant)  Reading: Luke 1 57-61a  This is the record of John (Gibbons)  Advent Collect  Blessing  E'en so Lord Jesus quickly come (Manz)  Hymn: Lo he comes with clouds descending  Toccata: Vom Himmel hoch (Edmundson)  Southwark Cathedral Choir, Stephen Disley (organ), Peter Wright (conductor). Royal Liverpool Philharmonic Orchestra and Choir. Philharmonic Youth Choir (conducted by Simon Emery), Stephen Disley (organ), Ian Tracey (conductor). Kiri Te Kanawa, Jerry Hadley, Sally Burgess, Willard White. Liverpool Cathedral Choir, Royal Liverpool Philharmonic Choir, Royal Liverpool Philharmonic Orchestra, Stephen Disley (organ), Ian Tracey (Chorus Master), Carl Davis (conductor). This recording was captured at the premiere in Liverpool Cathedral, with McCartney in attendance. The oratorio spent many weeks on top of the classical charts worldwide, and even made it to number 177 in the regular album chart in the US. Plainsong: Blessed City, Heavenly Salem (Mode 2 Melody)  Hymn: O worship the Lord (Rheinhardt, Ms 1754)  Psalm 84: O how amiable are they dwellings (Chant, Ms)  Morning Glory (Barry Rose)  Before thy throne (Malcolm Boyle)  Daughters of Zion (Malcolm Boyle)  Thou, O God, art praised in Zion (Malcolm Boyle)  Missa Brevis (Josef Rheinberger)  Lord, thou hast been our refuge (Edward Bairstow)  Save us, O Lord (Edward Bairstow)  Blessed City, Heavenly Salem (Edward Bairstow)  The Choir of Chester Cathedral, Graham Eccles and Stephen Disley (organ), Roger Fisher (conductor). Includes: In the bleak midwinter  Hark! The herald angels sing  Ragtime carol  Posthorn gallop  The holly and the ivy  Unto us a boy is born  We've been awhile a wandering  God rest ye merry gentlemen  Brass Christmas Medley  Stille Nacht  O come, all ye faithful  We wish you a merry Christmas  The Royal Liverpool Philharmonic Choir; St George's Primary School Choir, Wallasey; Philharmonic Brass; Stephen Disley (organ); Ian Tracey (conductor). Unedited concert performances from Gloucester Cathedral and St Albans Abbey  English Heritage Orchestra, Philharmonic Choir, Stephen Disley (organ), Graham Mayo (conductor).